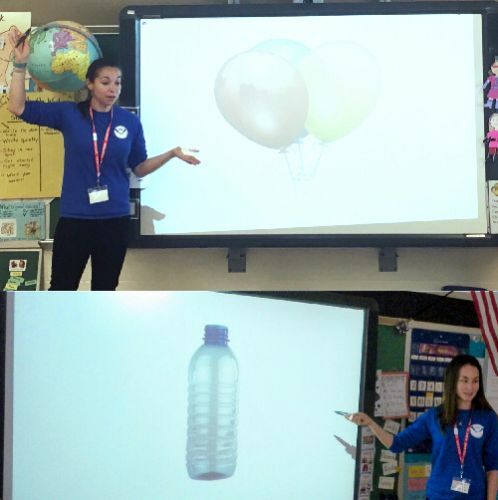 APRIL 28, 2017--On April 21, Marine Debris Program staff participated in an Earth Day outreach event at Rosemary Hills Elementary School in Silver Spring, MD. Over the course of three hours, 175 kindergartners and their teachers learned about ‘trash in the ocean’ and what they could do to prevent it. The lesson included an interactive presentation and watching part of the Regional Emmy Award-winning ‘Trash Talk’ series, followed by hands-on examples of debris students might find it their own homes. Then students had the opportunity to answer marine debris questions (most of which they answered correctly!) and simulate what it is like to be an entangled sea turtle by trying to ‘escape’ from a rubber band placed around one of their hands. Both teachers and students were excited about what they learned and the Marine Debris Program has been invited back next year. The event provided a great opportunity to educate young students about the ways they can be involved in keeping the sea free of debris. For additional information, contact: Amanda.Laverty@noaa.gov. Marine Debris Program staff give examples of common types of marine debris. Image credit: NOAA.